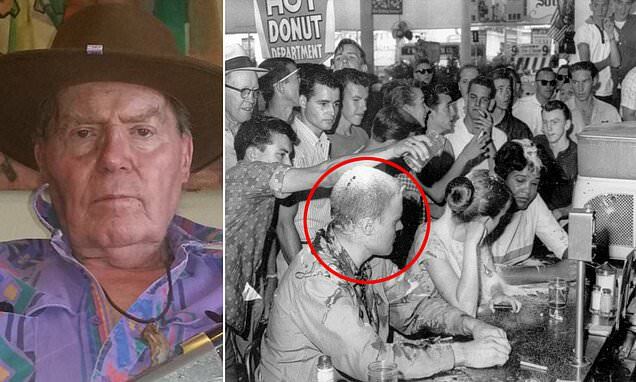 John Salter Jr., one of the three infamous faces of the iconic Mississippi lunch counter sit-in, has died aged 84 his family have said. Salter was a sociology teacher and NAACP youth adviser in Mississippi in the early 1960's, working closely alongside Mississippi NAACP leader Medgar Evers. On May 29 1963, Salter joined black and white Tougaloo students, Anne Moody and Joan Trumpauer, during a sit-in to protest segregation at a lunch counter in the Woolworth's store in downtown Jackson. Trumpauer is now the last surviving member of the brave trio. An angry mob of young white men doused them in mustard, sugar and ketchup - and Salter was even attacked with brass knuckles and broken glass. A black-and-white photograph of the protest gained international attention, and it's continued to be synonymous with the civil rights movement ever-since. 'I was burned with cigarettes, hit and had pepper thrown in my eyes,' Salter wrote in an article published in The Guardian, in 2015. He died at home in Pocatello, Idaho on Monday aged 84, after battling a short illness. The two young women who accompanied Salter in the protest were Anne Moody, an African-American student who would go on to write the memoir 'Coming of Age in Mississippi'; and white Tougaloo student Joan Trumpauer Mulholland. Moody died in 2015, but Mulholland is alive still and living in Alexandria, Virginia.